Extracts from the Log Books of Captain Francis Austen at the National Maritime Museum, Greenwich. Published by permission of Dr. Morriss, Head of Manuscripts. The surgeon of HMS under my Command having represented to me that there are several sick men on board the said ship whose cases make it essentially necessary that they should be supplied with a larger proportion of wine than their daily allowance, and requested I would order such an extra allowance of wine to be supplied as might be deemed essentially necessary to promote their recovery. 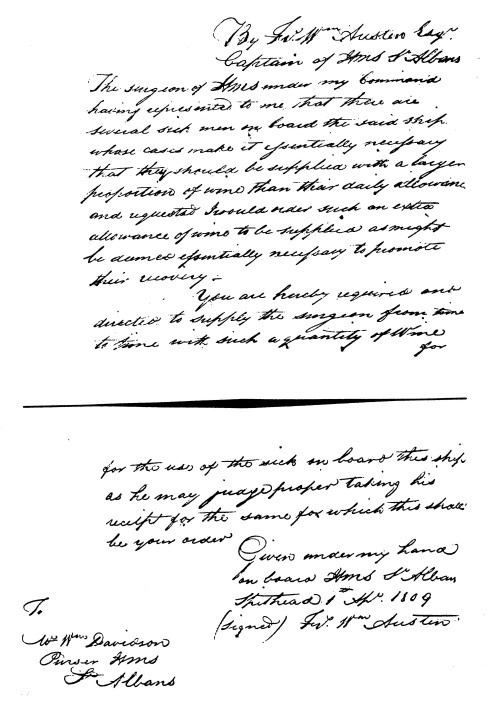 The Purser of HMS under my command having represented to me by letter of this date that on opening a cask of Pork eleven pieces were found to be rotten, stinking and unfit for men to eat, and requested I would order them to be surveyed. You are hereby directed to take a strict and careful survey on the Pork complained of, and if found as represented and in your opinion a nuisance in the ship you are to see it thrown over board into the sea, reporting to me from under your hands your proceedings therein together with your opinion why the said Pork became in such a state.